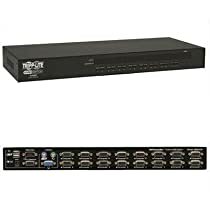 Tripp Lites NetController 16-port USB/PS2 KVM Switch is an affordable, highly flexible enterprise class KVM Switch. This unit gives the user a choice of PS2 or USB inputs for the keyboard and mouse, as well as USB or PS2 attachment to the computer. A dedicated daisy-chain port offers expandability up to 256 computers by connecting up to 16 levels of B042-Series KVM switches. On- Screen Display (OSD) menu functionality allows for easy switch management and port selection. Other features include: password protection, auto-scanning, auto-logout, firmware upgradeable and video support up to 2048 x 1536 (QXGA). Mounts easily in a standard 19 inch rack cabinet, and includes all necessary mounting hardware. Use only Tripp Lite P780 series USB/PS2 KVM cable kits with this unit.